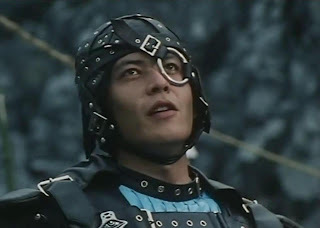 Wishful Thinking: How Dairanger Could Have Handled Its Ending! Dairanger's ending for me sadly can get into a confusing direction. 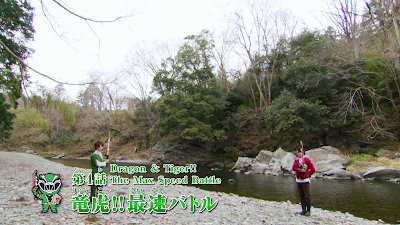 Now I'd like to cite what I really wish happened during Dairanger's finale arc. Here are some of the stuff that I thought needed to be worked out. I am writing this wishful thinking based on my speculation of the clay Gorma. There should have been some kind of explanation along the way like how can a clay dummy of Gorma XV possess memories of the real emperor? In my case, I might have it where Shadam might say something like, "Your majesty, your real body already perished long ago! I recreated you a body of clay so I can use you until my true plans were revealed. You were an idiot to think I was serving you! I transferred your spirit right into a clay body for that purpose!" Then we can have a bit of explanation to why Zaidos turned into dust. While Gara asks Shadam, Shadam refuses to reveal his master plan. He thinks and says, Well, I had to revive a few dead Gorma. At this point, I can get my position I so desired! The clay Gorma plot would have worked better if the finale wrapped it up in a better way. Also, I want to think of the Gara plot. 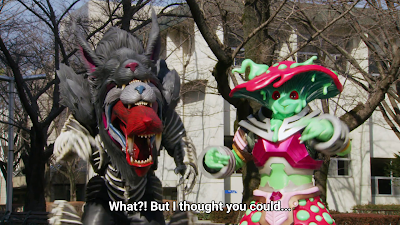 I was thinking it's oh too random to have Gara revealed as both a fake and a real one. It's confusing to how the clay Gara had the memories of the real one. They could at least explain like the fake Gara was a result of the hatred of the real Gara. In short, the fake Gara is hatred personified and until the fake Gara is destroyed, she cannot truly ascend. The result is that, Gara destroys the clay Gara born out of her hatred. The real Gara finally destroys the creature born out of that hatred. At least, it will link the clay Gara to the real Gara. Or better yet, explain it that when Gara's eyes were cured by Kujaku, her soul escaped from the clay body Shadam trapped but it wasn't complete. Gara needs to be whole again. Alternatively, it could just be wrapped up Liveman style. Remember how Mazenda died in Liveman? We could have Gara who like Mazenda starts to see the error of her ways. Kujaku later descends, we have Gara and Kujaku make peace. Then Gara reveals herself to have used a clay body in her foolish quest for revenge. The clay body is destroyed, Gara's spirit leaves it and she and Kujaku make peace at last. Last but not the least, how Shadam should have died or at least, how his climax should have been. I don't think I would have much of a problem with him being clay IF at least we get an explanation. So it would be better if he finally said at his end, "Crud! I forgot I transferred my soul into a body of clay 6,000 years ago!" before he dies verifying that indeed, they did get rid of the real Shadam but he was no longer in his original body. However I prefer if he died a bloody not muddy death. I thought that give the Gorma a better wrap-up than leave the ending hanging and people guessing.